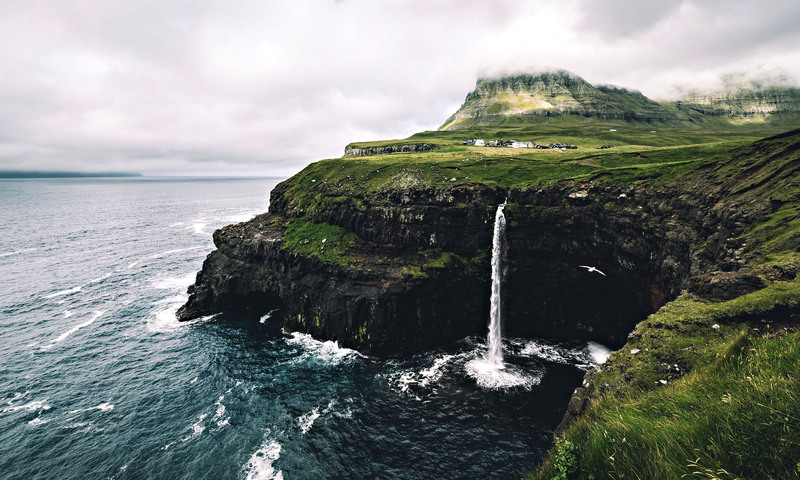 While neighbouring Iceland pulls almost two million travellers each year, the Faroe Islands are among Europe’s best-kept secrets. Freya Muller discovers an untamed archipelago rich in legend. Waves collide against basalt cliffs, sending a cloud of salty spray into the air. Battered by wind and rain, it’s not an entirely pleasant day to be bumping across the North Atlantic, but I’m determined to reach Mykines, the westernmost isle of the remote Faroes and a paradise for migratory birds. Although known for its breeding colonies of northern gannets, black guillemots and kittiwakes, it is the sweet and inquisitive stares of the puffins that have drawn me to the edge of the archipelago. With two unsuccessful scouting missions already behind me, I’m hopeful that today may be the day I spot these chubby little birds. Twitchers aside, this remote and windswept cluster of 18 volcanic islands anchored between Scotland, Norway and Iceland remains largely under the radar, even as the popularity of Iceland soars. In my eyes though, it’s every bit as enticing. A lonely boat hovers between the cliffs of Gjógv’s natural harbour. Cruising alongside a slate-grey wall dressed in moss, I can see why these rugged landscapes are woven with legends of epic Viking voyages and whimsical folklore. It’s only my fourth day here and I am already acquainted with the tale of the seal woman who cursed local men and the greedy Icelandic giants who stand as spires of rock fixed in the landscape after trying to steal an island. After 40 minutes of rocking and rolling on the ferry I’m relieved when a tiny marina wedged in a gap in the cliff comes into view. 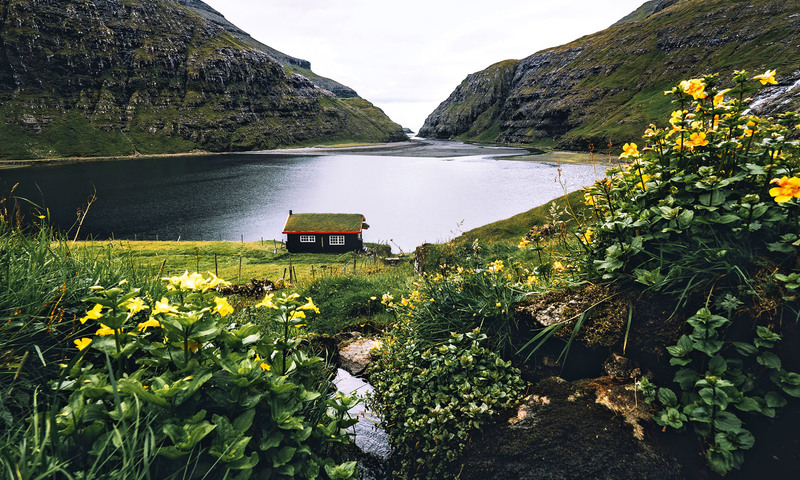 Scarcely more than a dozen inhabitants live in the island’s tiny settlement, a quintessentially Faroese village of manicured turf roofs and white window frames. A mosaic of dewy green fields carpets the way to the western peninsula, where puffins are known to nest. I march along the ridgeline under the watch of grazing sheep. Blades of grass poking through their teeth make them look like a scruffy gang of cowboys. Kópakonan, the seal woman, stands above the battered shore of Mikladalur. As I round a bend, a tornado of birds comes into view. Flashes of crimson speckle the horizon and I realise I underestimated the enormity of this spectacle. Puffins flounce through the air, furiously beating their wings in an attempt to keep portly bellies aloft, while thousands more ride the inky waves, their white bodies appearing like stars in a night sky. After a series of loops in the aerial velodrome, several puffins land clumsily with glassy-eyed sardines drooping from their beaks. They disappear into burrows to feed expectant pufflings. At the westernmost point of the island a cackle of seabirds carries on the wind, rising from those breeding in the cliff walls. The stench of guano is almost unbearable. Mulafossur Waterfall near Gásadalur tumbles into the sea. A lighthouse pokes from the earth in the distance, kept company by a red-roofed keeper’s hut. To work out here, at what seems to be the end of the world, must be a beautiful but exceedingly lonely existence. Ferries to Mykines operate solely during summer, after which a helicopter is the only way to reach the isle. During harsh winters, storms can leave inhabitants stranded here for days at a time. Looking back along Mykines toward the fjords undulating into the distance is tremendous. Rivulets have carved waves into the jet-black rock face over millions of years. I can’t ever remember setting foot anywhere more wild or at the mercy of the elements. The days slide by in a blur of curious sheep, spectacular coastal roads and homes that would fit in the pages of any children’s fairytale. Although rain is almost constant and sombre skies unabating, it only seems to intensify the allure of the islands. Kallur Lighthouse perches on the tip of Kalsoy. I marvel at the waterfall at Gásadalur that tumbles from a precipice toward the ocean, only to be whisked away by the wind, and wait for the incoming tide to flood the bay of Saksun and form a mirror of the sky. Later, I explore the medieval ruins of St Magnus Cathedral and contemplate indulging in the 17-course tasting menu at Kok, the only Michelin-starred restaurant in the archipelago. As I watch a tall ship with lowered sails pass narrow fjords and pinnacles of rock being assaulted by the northern seas, I wonder if perhaps they are the central characters of another local legend. One surprisingly sunny day I venture north on the island of Streymoy along a serpentine road that delivers me to charming Tjørnuvík. Sat in the valley, this unassuming hamlet is hugged by a brilliant blue bay one might expect to find in the Caribbean rather than a moody archipelago so close to the Arctic Circle. Marking the horizon are the petrified figures of Risin and Kellingin, that sneaky giant and his wife, a witch, who unsuccessfully attempted to steal the islands and were transformed into sea stacks for their sins. A puffin lands on Mykines with its catch. The scent of waffles pervades the centre of town, flowing from an open-air stand run by a couple who sit yammering on a wooden bench. Now that high season is over I may be today’s only customer. In this rare moment of warm autumn sunshine, waffles topped in cream and served with a side of jovial company are a welcome afternoon treat. On the isle of Vágar sheep wend along the mossy banks of Sørvágsvatn, the largest lake in the islands, to a final incline leading to a ragged bluff. From here the curved lake appears to hover above the ocean, an optical illusion that has captured the imagination of keen photographers in recent years. Leaning over the edge sends a bolt of adrenaline down to my feet. 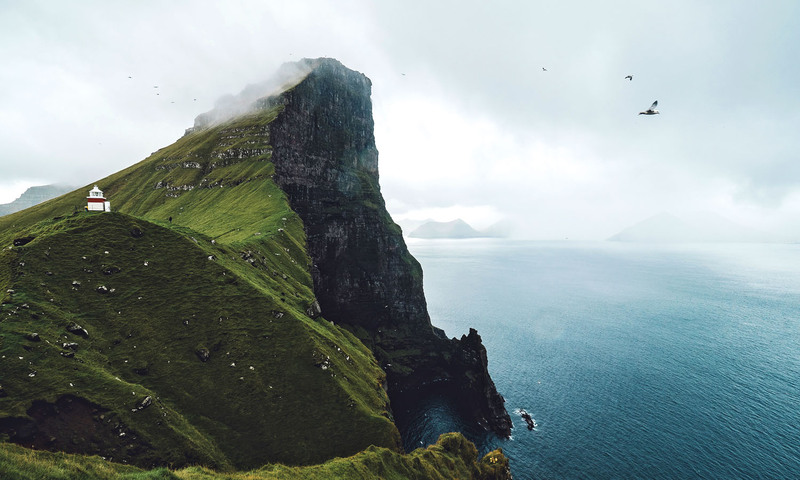 The Faroes are home to some of the tallest sea cliffs in the world, and although this one is more than high enough to send me trembling as I stumble away from the brink, it doesn’t even come close to qualifying for the top spot. Later, Johannes Hansen, a local adventure guide, invites me in for a traditional feast. In his singsong accent, he relays the isle’s dark history, reawakening my sense of vertigo. According to legend, as a punishment for laziness or simply falling ill, slaves were tossed over the cliffs and into the angry sea. In a blissful daze after a few tots of homemade schnapps it’s hard to imagine these modern-day Vikings, with their cheerful, rosy cheeks, could possibly have ancestors – even fantasy ones – capable of such cruelty. A cottage stands watch over the bay of Saksun. Conversation turns away from tales of malevolence and Johannes shares yarns about houses that have been transplanted between villages over the centuries, carefully shifted brick by brick, and explains why the Faroese always wear oversized hats jutting to the left – it’s so they can easily remove them when shaking hands with their right. Famished, I work through a spread of unfamiliar meats. Skerpikjøt, a tender, wind-dried mutton that’s been hanging in Johannes’s shed for almost two years, gives off the funk of blue cheese. Dried flakes of fish and pilot whale blubber and flesh also feature on the menu. Although the annual grindadráp (whale hunt) is controversial on the international stage, locals fiercely defend the tradition. On these remote, rugged islands it’s difficult to survive on agriculture alone, and so whaling has sustained the communities through many harsh winters. 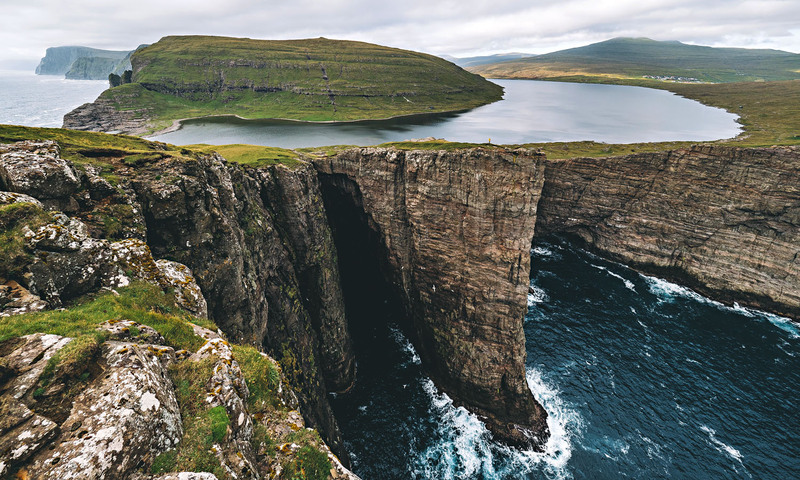 Sørvágsvatn’s infamous cliffs create an optical illusion. Overnight, mist envelops the homes of the 40,000 people living in the capital city of Tórshavn – almost the archipelago’s entire population – and I wake to a sea of white lapping at my window. Intent on embarking on a multi-isle road trip, I push on to the east along Highway 10. A bridge carries me over the sound between Streymoy and the isle of Eysturoy, where a sub-sea tunnel connects me to Borðoy and a ferry karts me to Kalsoy, a narrow island resembling a knobbly witch’s finger. The grass-roofed village of Mykines. As is the case in many Nordic nations, the building philosophy seems to be “if we can’t go over it, we’ll have to go through it”. I lament the all-too-dim headlights guiding me into an unlit passage leading into the belly of a mountain. It spits me out at the village of Trøllanes, where I swap wheels for feet to reach my final destination. Perched by the Kallur Lighthouse, which stands sentinel on the emerald tip of the island, I watch the fog roll over the end of the earth. Driving back between the fjords beneath a blanket of grey, I’ve come to realise that the melancholy skies lend well to the islands’ stark beauty and sinister legends. And yet, as if on cue, the clouds part and a halo of golden light spills across the landscape. Perhaps it’s a sign that I should do as the Faroese do and transplant my house brick by brick into this fabled landscape. A local plays golf on open grasslands. Fermented lamb is served with bread. Qatar Airways flies from several Australian cities to Copenhagen, via Doha, from AU$1230 return. From there Atlantic Airways offers return flights to Vágar from AU$430. Tórshavn is an excellent base, with many dining options and easy access to islands further afield. Grass-roofed Hotel Føroyar offers rooms with beautiful views overlooking the capital and a sumptuous buffet breakfast from AU$300 a night. A secondary building houses the slightly more simple Hostel Kerjalon, where a double will set you back AU$120 a night. Hire a car from Unicar on Vágar for around AU$95 per day for three days during the high season.